My cousin Irene and I seem to have a common interest in World War II era history. 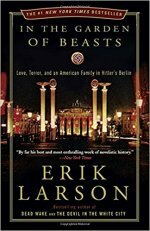 Shortly after I posted my thoughts on William Russell’s Berlin Embassy, Irene recommended I check out Erik Larson‘s In the Garden of Beasts. I promptly added the title to my to-read list. “In the Garden of Beasts” is set during William Dodd‘s time as ambassador in Nazi Germany. The Dodds went in a bit naïve, but in time they came to understand what Nazism meant for Germany and the rest of the world. I can’t help wondering about the Jewish family that owned the house the Dodds were staying in. That Jewish family was eager to have Dodd there, because they felt Dodd’s presence kept them safe from the Nazis. I don’t think there was any note about whether that family survived or not. “In the Garden of Beasts” has more information and details than “Berlin Embassy”. But “Berlin Embassy” was written by someone who was actually there and published shortly after he returned to the United States. While there’s not as much detail in Russell’s book as there is in Larson’s, I felt that Russell’s book confirms some of the things Larson wrote about. Nazism needs to be stamped out whenever it shows its ugly head. Nazism is like cancer, it spreads until it’s caught and dealt with. I just bought it. Only kind of books I can get into. You’ll find yourself comparing a lot of it to what’s going on now. I already am. I knew I would. It is basically the same thing , but if you can get a trumptard to read it, they won’t see it that way.